Bruno van der Dussen, Minister Plenipotentiary to the Congress of Utrecht (1713), where he signed the peace treaty. He is among the major European diplomats of his time. Kornelis Arentzoon van der Dussen, 1481-1556, was mayor of Delft in 1524 and 1530. He fathered nineteen children by his three wives ! He adopted the maiden name of his stepmother, Machteld van der Dussen, and was closely involved in a famous feud between the magistrate (= municipality) of Delft and brewers of the city. The case was important because it was brought up before the Emperor Charles the Fifth. On this portrait painted by Jan van Scorel (Rijksmuseum, Amsterdam) which exists in several versions and copies, it is unclear whether this is an original) he holds a document denoting his role as magistrate of the city Delft. "Portrait of the Catholic family van der Dussen" H van Vliet, 1640 Prinsenhof, Delft. This is the family of Michiel, 1600-1683, his wife Willemine van Setten, his children Kornelis, Elizabeth, Maria, Otto, Anna. The site "essential Vermeer" makes the following comment: the painting, representing musicians playing and singing, suggests that harmony prevailed within the family. The painter has represented the wealthy aristocrat Michiel, who was head of the family, playing the recorder with his two elder sons, beside the mother and their three daughters. Their Catholic faith is signified by the crucifix prominently displayed on a back shelf. The music they are playing can be recognized by the score: it is the Motet "Factum is silentium" for 8 voices, H Praetorius (Hamburg), in honor of the Archangel Michael, patron saint of the family... According to a letter written in 2004 by "House of Vermeer" Anna and her sister served as models for the painter Vermeer. The resemblance is striking, especially in the painting "Christ in the House of Martha and Mary" (Museum of Edinburgh ). Anna and her husband Hendrik van Eem later supported Vermeer financially, to include the purchase of the house "De drie Cimbelen," which became his workshop where his famous "camera obscura was located." Adriaan van der Dussen, 1586-1653, took part in the plot of 1623 against Prince Maurice of Orange Nassau. He owed his salvation by escaping in a barge, hidden under wheels of cheese ! Under the protection of the Spaniards, he continued his military career in Germany on the orders of the Emperor. Elizabeth Paauw, wife successively of Jan van der Dussen, director of the East India Company in 1682, followed by Dirk van der Dussen, alderman in Delft. Painting by Jan de Baen. Elizabeth Aletta Slicher, 1727-1779, wife of Nicolas van der Dussen, lord of Oost-Barendrecht, with their son Eewoud. Painted in 1750 by M Verheyden (Breda Museum). 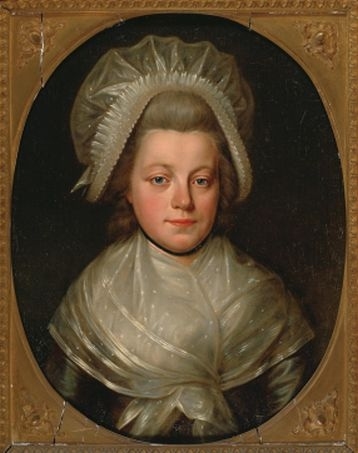 Helena van der Dussen, 1758-1822, painting by Isaac Schmidt, Frans Hals Museum. Not noted in the genealogy... Wife of Diederich van der Burch. Catrina van der Hoef, 1600-1666, wife of Eewout van der Dussen, 1574-1653, Mayor of Delft and Ambassador Extraordinary to the King of England. Michiel van Mierenveld painting. Pieter van der Dussen, 1654-1716, at the age of 6 years ( Jan van Haensbergen, 1642-1705.) Priv coll. Geertruid van der Dussen, Lady of Harinkarspel, married Johan Basius in 1602 who was master advisor of accounts for Holland and West Friesland. (Michiel Johansz.van Mierevelt, Frans Hals Museum, Haarlem). In the choir of the Old Barbarachurch of Culembourg, there is a white marble tomb, final resting place of Catharina Alida van der Dussen (1690-1745) , wife of the burgmeester of Dordrecht. Catharina fled in 1733 in Culembourg -a free state- to escape her alcoholic husband who mistreated her. Catharina asked for asylum to Culembourg city where she was protected against lawsuits that her husband Damascus launched to retrieve her and her money. This Ex-Voto figures a small girl van der Dussen. It hangs in the Basilica Sint Martinus van Halle, near Brussels. It was painted between 1800 and 1850. We don't know who it was. Did she recover from some illness ? Peter Paul Rubens is shown here with his first wife Isabella Brant, at the time of their marriage in Antwerp in 1609. (Not to be confused with his second wife Helena Fourment, his famous model). Eugène François van der Dussen, lord of Bornival, married in 1720 their great-grand-daughter, Constance Thérèse Rubens. Their descendants are extinct.